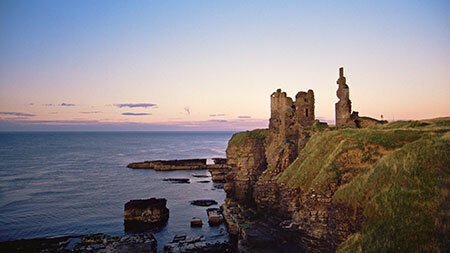 Located about five miles north of Wick, Castle Sinclair Girnigoe is dramatically and grandly situated on a long narrow peninsula projecting into Sinclair Bay and the North Sea with perpendicular sides of between fifty and sixty feet. It is separated from the mainland primarily by an arm of the sea known as a goe. This is a Norse word meaning a cave, a rocky inlet or creek or a deep ravine that admits the sea. The remaining separation is by a dry moat over which there was a drawbridge to the Castle which was protected on the mainland side by a barbican. There are two distinct groups of buildings forming the Castle as it is divided into an inner and outer bailey by another dry moat. This impressive stronghold was built as one Castle in the late 14th century and adapted regularly over time until abandoned and partially demolished in the mid 17th Century. 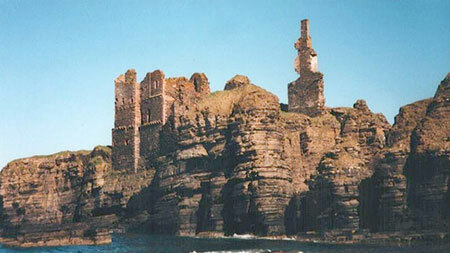 It is built of Caithness slate with red sandstone facings and was once lime-washed. Archaeological excavations have revealed that was a high status Castle of vital importance and had incorporated into it the latest architectural ideas. It has the highest classification for preservation in the UK being a Scheduled Monument and was listed in 2002 by the World Monuments Fund as one of the 100 Most Endangered Sites in the World in their Watch List published every two years.